Win a Bentley Continental GT V8! 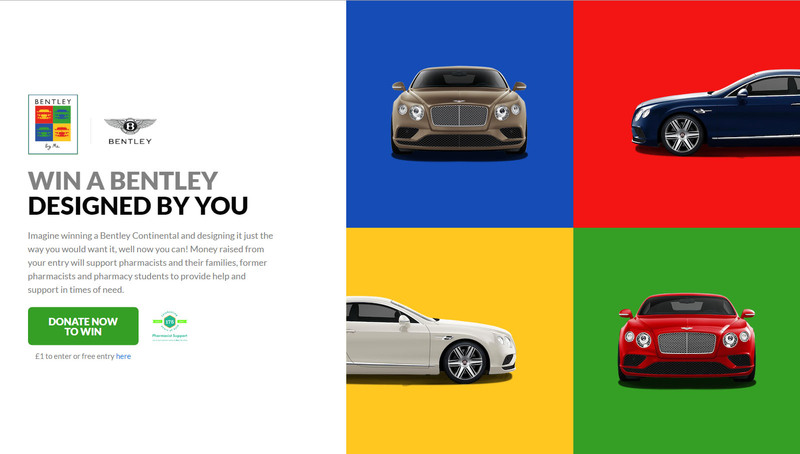 Want to be in with a chance of winning and designing your very own Bentley? We have joined forces with Bentley and Care2Save to help raise funds for pharmacists and their families, former pharmacists and MPharm students in need and to also help support those around the world in need of palliative and hospice care. Proceeds from tickets sold by Pharmacist Support for the Bentley by me lottery will be split evenly between the profession’s charity and Care2Save Charitable Trust – a global initiative, chosen by Bentley Motors as one of their charities of the year, to raise awareness and funds for palliative and hospice care. Never before offered by Bentley Motors, this incredible prize draw will enable the winner to choose from a selection of exterior colours and interior finishes from the Bentley palette to create the Bentley of their dreams. Alternatively, should a cash prize be preferred the winner can still enjoy the excitement of designing and creating a beautiful car, that Bentley can then sell on with proceeds from the sale to be used as the winner so desires! A donation of £1 will enter you into the draw, with larger donations securing additional free entries (For £10 you’ll receive 12 entries, for £20, 25 entries etc). For your chance to win this amazing prize click here , or contact the fundraising team on fundraising@pharmacistsupport.org to request your ticket. No entries to the draw will be accepted after midnight on the 14th August 2016. The draw will take place on 30th September 2016 with the winner announced on the same day.